Do you have too many cucumbers in your garden? Here’s a way to use some after you’ve given away so many your friends won’t take any more. 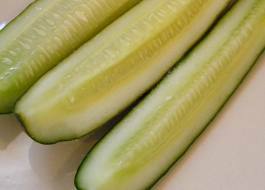 Soak medium sized cucumbers 24 hours in a brine made of 1 cup salt to 8 cups water. Remove from the brine and dry. Make a vinegar solution of 2 cups white vinegar to 3 cups water. Add 2 tablespoons of mixed pickling spices, and several small bunches of fresh dill. Bring to a boil. Add the cucumbers and take from heat. Into each sterilized quart jar place 2 cloves of garlic and 2 small hot peppers. Pack cucumbers in the jars with at least one small bunch of the dill. Put the vinegar back on the heat. Bring to a boil. Completely cover cucumbers in jars with solution. Put on the cap and screw band firmly tight. Put the jars in a large pot of water deep enough to cover the jars at least one inch above the lids. Boil for 15 minutes. Take the jars out of the water immediately after the boiling and set them on the counter. Separate the jars so cool air can circulate between them. As the jars cool, the lids will pop. When they are completely sealed, check the lids. They should be slightly concave so you can’t push the middle of the lid down. If any jars didn’t seal, put those in the refrigerator or boil the jar again in the boiling water bath.